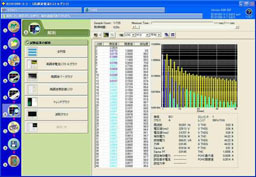 The 761922 harmonic/flicker measurement software allows you to load data measured by the WT3000/WT3000E onto a PC and perform harmonic measurements conforming to IEC61000-3-2 Ed 4.0. The WT3000/WT3000E supports the 50/60 Hz (10/12 cycles) of interharmonic measurement required by IEC61000-4-7 Ed 2.0 Am1, which may become a requirement for standards measurement in the future. Decompress the downloaded file. The harmxxx_t folder will be created. Please uninstall the previous version first, if you have previous version installed. Double click the Setup.exe to start the installer.